Students in Spain give a presentation about Amman Imman. Students from CCE-Montessori Palau in Girona, Spain took part in the International Montessori Adolescent Summit sponsored by the Montessori Institute for the Science of Peace(MISP). The summit's theme this year was "Tapping the Well of Water Innovation: Seeking Sustainable Solutions to Water Access Quality, and Conflict." Amman Imman was invited to be interviewed by several student panels to round out their research about water issues. 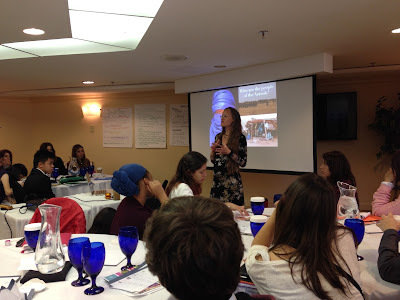 All the students at the conference had the opportunity to hear Ariane's presentation of Amman Imman, and the students from Spain chose to take action. We are the students from Spain that participated in the MISP Summitthat took place in Washington, DC in April. We are contacting you to explain what we have been doing after the summit in relation with your organisation. Firstly we decided to give a presentation to all the students in our school so that they became aware of the water crisis. We did it from primary to high school students and succeeded. We encouraged them to take part in a walk for water that took place on May 17th so that we could raise money for Amman Imman. About 70 people came and we raised approximately € 300. We attach some photos we took during the volunteer work. Moreover, we have also thought about doing other activities next year. We were wondering if we could send the money to your organisation. Which is the best way to send the money?